Microscopes are an important and common tool used extensively by scientist, doctors and researchers. Like a telescope, which allows its user to view objects that are far away, microscopes use a series of refracting lenses. But while telescopes gather large amounts of light from a distant and dim object, a microscope gathers a small amount of light from a tiny, well lit specimen that is close by. The first magnification device was a clear reading stone used around 1000 AD to make reading material appear larger. In the 1500 - 1600's, scientists experimented with stacking multiple lenses together in order to increase the magnification power. By the eighteenth century the microscope had improved to the point that it became a common feature in laboratories and doctor's offices to study microscopic bacteria, cells and other tiny organisms. Microscopes continued to improve through the nineteenth century with the invention of the ultramicroscope that could study objects below the wavelength of light. The contrast microscope permitted the study of colorless and transparent biological materials, while the electron microscope allowed scientists to view objects as tiny as an atom. More recently, the scanning tunneling microscope was invented. This machine gives three-dimensional images of an object down to the atomic level. Today microscopes help doctors to diagnose diseases and scientists to learn how cells react in different situations. From homes, to schools and research facilities, microscopes open up a world of life beyond the range of the human eye. To make microscope viewing more comfortable, many accessories and adaptations have been created. Two eye pieces instead of one are now common in many high powered microscopes, as is the ability to view objects through both the scope and on a separate screen or monitor. 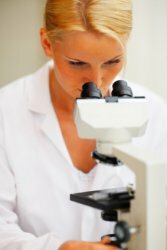 Microscopes have the ability to adjust position for more ease of use and eyeshields provide a crisp and clean image. Field Optical Research has been making EyeShields for years. Traditionally used with rifles scopes and binoculars, EyeShields are now becoming popular with microscope users. Not surprising when you consider how EyeShields block ambient light and glare resulting in less eye strain. To learn more about how EyeShields can help make your microscope viewing more enjoyable, click here.